OUTING TO WITNEY - to see the recently excavated 12th century Bishop's Manor which will shortly be open to the public. We had originally planned to also visit North Leigh Roman Villa but hadn't realised that this was included in a recent outing organised by Sheila Woodward. We will instead spend the afternoon at Cogges Manor. Details and application form enclosed. contact Bill Firth, 49 Woodstock Avenue, NW11 Full details in May Newsletter. WEEKEND IN DORSET, staying in Sherborne and visiting Avebury, Dorchester, Maiden Castle, Cerne Abbas, Abbotsbury, Somerset Levels Centre and Glastonbury. The trip is fully booked but we are happy to put any interested member on the waiting list. There can always be last minute cancellations. Will booked-in members please send balance to Dorothy Newbury if they have not already done so - Thanks. THE ROMAN POTTERY MANUFACTURING SITE IN HIGHGATE WOODS" by Harvey Sheldon First in new season of HADAS lectures. "EXCAVATIONS IN NORTHERN IRAQ - from the Greeks to the Mongols" by Dr John Curtis HADAS lecture. MARY O'CONNELL, our member who lectures to us occasionally, and will in September be again taking us on one of her fascinating walks, has received the honour of being made a Freeman of the City of London. Mary, a City Guide, has no plans to exercise a privilege accorded to City Freeman - that of driving her sheep through the City! Congratulations, Mary!TAMARA BAKER, a long-standing member who came regularly to lectures and outings, has been laid low with a leg operation. We are pleased to hear she is recovering well. DOROTHY THOMAS, joined the Society in 1973. She moved to Dunoon in 1984 and has continued membership with us till now. We would like to thank her for her 20 years of interest in the Society. FRIEDA WILKINSON. Helen Gordon reports that Frieda is home again after another spell in hospital, and is improving. Frieda would be happy to hear from, and see, HADAS friends. This is an exhibition not to be missed by anybody interested in Roman history and the story of Pompeii in particular, I would heartily commend it to HADAS members. It has not been very widely advertised - it was mentioned in the "Ancient" magazine, it would be open until 21st June. I had not been able to find any more about it, until making an infrequent journey on the Underground and seeing posters displayed. Anybody not normally travelling by Tube could miss it altogether. I had been keen to see the exhibition, having visited Pompeii (and also warmed my hands on the steam vents around the rim of Vesuvius!) Much of the city was unexcavated at that time - 1982 - and many acres still are. It was possible to see the great mounds of ash still covering parts of the city. The exhibition is extremely well organised, and the 200 objects on display have never before been exhibited in the UK. All are finds from very recent excavations. Due to the circumstances of the eruption most of the artifacts are complete and largely undamaged, and hence are more impressive than the shards to be seen in the Roman galleries of most museums. One of the first items to be seen is the body of a young woman, encased in transparent epoxy resin, personifying the tragedy of the disaster. Amongst the domestic items is a magnificent food warmer, the workmanship of which would be difficult to equal today. In a small edition it resembles the old wood-fired stoves sometimes seen in early country churches. The wealth of the patrician Romans is exemplified by the fine statues and splendid frescoes which adorned their villas. These frescoes and the scenes shown on the many urns and bowls provide a fascinating picture of the Roman way of life. To highlight this further a number of examples are shown of graffiti - a lot more imaginative than that of today! Also, tablets of the love letters and poems sent by the young bloods to their girl friends. Technology has been widely used to enhance understanding of life in Pompeii and the effects of the eruption. IBM was largely responsible for the audio-visual displays in each of the galleries. It is possible to see graphic simulation of the phases of the eruption, to walk through the streets of Pompeii and, by finger touch on the screen, visit houses and see many of the artistic displays. The rooms upstairs show the detailed history of the excavations of Pompeii from the earliest times. It was a very enjoyable and interesting afternoon! Fortunately for us, Fred advises that the closing date has been extended to 2nd August, and the location is ACCADEMIA ITALIANA, 24 Rutland Gate, off Knightsbridge. The British Museum recently acquired a 7th C BC Assyrian limestone relief carving of a wounded lion in its death throes. Originally excavated at Nineveh in the mid-1800's by W K Loftus and artist William Boutcher, the 31x17cm carving had "disappeared" and was only known by photograph. It has now been donated by an anonymous descendant of Boutcher. The Keeper of the Dept of Western Asiatic Antiquities at the BM, Dr John Curtis described it as one of the museum's most important acquisitions that he can remember. You will have the chance to quiz Dr Curtis further on his new pet when he gives the HADAS November lecture! As part of their master plan to excavate the whole of medieval High Barnet, on Saturday 6th of June the HADAS excavation team began work on a new site in Barnet High Street. The site, on the corner of Fitzjohn Avenue and High Street, opposite the "Dandy Lion" pub, was until recently occupied by small single-storey shops, and had been cleared by the site owners, Bishops, along with the adjacent Guyscliffe House. Readers may remember that in 1990 the team excavated the area to the south of the then-standing Guyscliffe House and revealed medieval pebble yard surfaces and deposits; the present site was identified as being of interest at the time and we are pleased to be able to investigate the area further through the kind assistance of Mr Bishop. Using a borrowed JCB, the concrete shop floors and shallow brick wall foundations at the NW corner of the site were quickly removed and a 9x1 metre trial trench cut on a North-South axis also. The area under excavation was limited by the presence of adjacent rubble-filled former cellars. The area was then cleaned by shovel/trowel. Several features became apparent within the trench, including a possible post-medieval pot, an undated ditch, and a substantial flint/brick/tile wall foundation, sealed by demolition rubble, at the northern end of the trench, below the concrete shop floor. The site is heavily disturbed in places, but trowelling of the less disturbed edge quickly revealed several very sizable sherds of thumbnail decorated (rim and body) Hertfordshire grey ware, C1200 AD, probably from the same vessel. It is hoped to investigate the site further over the coming weeks. As always, new volunteers will be welcome to join the band of regulars. Cheers, Andy. We hear that Margaret Beesley, London University extra-mural lecturer in Archaeology, is getting up a party to go to South Africa in January 1993. This will be a ten-day visit to fossil hominid sites. It is being organised in conjunction with David Price-Williams who lectured to HADAS some time ago. There will be opportunities to examine fossil skulls in museum collections, and casts of recently discovered hominid fossils, as well as visits to a private game reserve and rock art sites. Accommodation will be in "Holiday lnn"-style hotels, and travel by minibus. The cost of £1,490 includes air fares to and from Johannesburg, accommodation, taxes, tips, the services of tour leaders etc. The only extras will be personal purchases and drinks. HADAS members and friends are invited to obtain further details from Margaret Beesley at 65, Langham Road, Teddington, TW11 9HF, tel: 081 977 3524. Last May I went with Muriel Large, Diana Watson, Marjorie Errington and Eunice Wilson - all members of HADAS - on a most interesting week's visit to the Isle of Man with the Historical Fellowship. We stayed with forty other friends at an hotel in Douglas. The tour was organised by Mr and Mrs John Shakespeare of Pennine Travel, with David Freke, an archaeologist. The first day we went to the Manx Museum and had a lecture with slides on the history of the Island, then to Kirk Michael to see the Celtic Crosses. We visited many Iron Age and Norse houses during the week. At Castle Rushen the interior is being re-created as it was when built, with tapestries on the walls, roaring fires, and tables laid for banquets. We visited Tynwald Hill, the Manx Parliament where they proclaim new laws each year on July 5th. We travelled on the Steam Railway and Manx Electric Railway to see the Laxey Wheel, and were lucky to have a clear day to see all the beautiful scenery on the Island. We were taken to Cregneash Village, a Village Folk Museum where we saw the remains of a Norse Long House. We rode on a horse-drawn tram prior to visiting the top of Snaefell on another nice clear day. In all, it was a most enjoyable week with so much to see on a small island - I would recommend a holiday there! Unfortunately, Mrs Frieda Wilkinson was unable to join us - her friends of the Historical Fellowship send their best wishes for her speedy recovery to good health. Dorothy says: how about a HADAS week there in 1993? Hot sunshine burning through clear blue skies followed forty of us from HADAS on our first outing of 1992, on Saturday 16 May. Our first stop was Sutton House. An hour or so investigating the successive stages of the house's development enabled us to see for ourselves what an unusual acquisition this property is for the National Trust. Since restoration work was still in full swing we carefully picked our way around what had become a building site, incorporating elements of the original fine Tudor merchant's brick house (called "the bryk place"), and later alterations of the 17th and 18th centuries. It was good to see panelling styles of three different centuries being skillfully renovated. On site it was easy to appreciate what a loss the theft of the Tudor panels had constituted and to rejoice in their return to grace, in keeping with original fireplaces. The present phase of restoration is scheduled to finish by September of this year. Both the full external renovation and imaginative community use projected for the house should make it a place for return visits. Our journey continued through the bustle and heat of East London, passing through the trappings of more modern signs of successive settlers on the flat river lands, until we climbed out into the fresh fields surrounding Waltham and it's abbey. Dr Ken Bascombe was our scholarly guide to the Visitor Centre, finely excavated Abbey Forge and outlying monastic precincts. In the cool of the Abbey itself we were treated to personal reminiscences of the recent excavations - would they could have been revealed before our eyes! In addition to the splendours of 12th century Romanesque columns, successive phases of architecture were discernable. Of particular interest is the medieval Domesday wall painting in the 14th century Lady Chapel. Provision of cream teas taken in the delightful timber-framed row of buildings adjoining the Market Square complemented the afternoon tour. Abbey bells rang a peal across the sun-drenched precincts, a knell of contentment on yet another most worthwhile outing, so ably arranged by Dorothy - to whom, our thanks! HADAS provides a wide range of activities in which many people find interest and pleasure, evidenced by the continuing large membership over the years. Winter lectures are usually well- attended, visits and outings often have waiting lists, other occasions are often over-booked. We have a vigorous excavation section and study group working most weekends at our Avenue House room. The library has been reconstructed, catalogued and is available to members. Finds are being classified and sorted, and exhibitions of our work are frequently made. A report on a major discovery by the Society has just been published, and a series of booklets on the locality are in print. By no means least, our monthly Newsletter informs, keeps members in touch and records the results of our investigations. All these things require organising, and the Society urgently needs new helpers to keep the good work going. 1 Programme Secretary, Dorothy Newbury would like assistance with planning and leading some of the visits and outings. This would include helping choose and reconnoitering new places to visit, selecting eating places and leading visits if so inclined. "Reasonable expenses paid". Dorothy's telephone number is: 081-203 0950 or 081 203 4508. 2 Phyllis Fletcher, our Membership Secretary for the past ten years resigned at the last AGM and is now well into her retirement. She has many other interests and feels that she has 'done her bit' for HADAS. The job is now much simpler than when Phyllis took it on, as most of the Society's records are held on our computer. The job involves liaising with the Treasurer and Programme Secretary, maintaining the membership list, chasing unpaid subscriptions, etc. It is an important job being in contact with new members and helping them and others to fully enjoy the Society. 3. We also need a volunteer to organise the distribution and sale of our publications. As most members will recall, we have published a number of booklets of local interest as well as the site report about our major discovery of the Mesolithic hunters' site at West Heath. A lot of the Society's reputation, and indeed reserves, are invested in these and it could be a pleasant and interesting task, involving a little correspondence and occasional visits to local societies and shops. Finally, a new Treasurer is needed. The writer has done the job for ten years and would now like the opportunity to do other work. The office of Hon Treasurer has been vacant since the AGM. Again, this is a much simpler job than it used to be as all the records are held on computer, thanks to the help of one of our members, Terry Dawson. The recording and book-keeping activity requires noting the few transactions each month which can be by cheque book and bank paying-in records. The computer is programmed to balance the books and can be done with Terry Dawson's help once every month or so. It is an interesting task, and keeps one in touch with all Society activities, and can now be done in a hour or so a week if done regularly. If you would like any further information, PLEASE, do not hesitate to contact any Committee Member. We look forward to some positive response! These were set out in a letter of 17 October 1991 from New Age Homes, following discussion on 16 October 1991 at the Museum of London with a plan showing suggested trenches. This provided for access by HADAS from 25 November 1991 but, owing we understand to delay in legal documentation, we were in fact unable to get on site until 19 December. There was not site hut so we were obliged to bring and take away all tools daily which limited our capabilities. We were able to do some inspection and marking out on 19 December, following machine stripping, and to excavate and record on 21/22 December, 4/5 and 11/12 January, with some additional machining kindly done by the Site Foreman on 6 January. We think we have adequately investigated the few features revealed. Grid Ref TQ 2245 8915 - a field sloping evenly down E to W from the glacial-gravel-capped ridge of the Burroughs towards the Silk Stream valley; obviously graded and turfed as a games pitch. Hendon was a Saxon and medieval settlement on the ridge (E Sammes excavations in the early 1970's found a Saxon ditch near the Church) and there have been some Roman finds in the area. From Crow's 1754 map, present Watford Way beside the site appears to follow the course of ancient Colindeep Lane up to The Burroughs crossroad; this map shows a cluster of buildings round the crossroad, but not extending as far as this site. The initial turf stripping (done on half the site by the time we arrived on site at the agreed time on 19 December) went down about 30cm to remove virtually all tha turf and turf undersoil which, from inspection of soil, included some Victorian and post-medieval artefacts. However, any features missed through this could only have been very shallow, and likely to have been disturbed by smoothing of the gradient when the field was made into a games pitch. The surface exposed was mainly grey humic sandy pebbly gravel, which we took to be natural, possibly disturbed in grading for turfing. On this surface were a number of stray finds of pot and clay pipes (we noted an unusually high proportion of complete bowls with some stem attached) dating back to the 1600's. This formed an interesting group of brown clay-fabric pipes of the period 1640-1700, in good condition, with 7 bowls and over 60 stem fragments of similar date. There were also several pottery sherds of similar date, including Tudor Green ware, Staffordshire Slip ware, and Tinglazed sherds. Noted across the west end of the field, nearest the retaining wall of the A41 sliproad, was a darker area of brick rubble/humic. 1 There appeared to be a concentration of sherds and clay pipes in an area 3x2m (Trench 1) was trowelled down to sterile natural clay, no feature revealed, so the artefacts appeared to be a chance scatter. Topsoil (101) here yielded one medieval greyware body-sherd; layer 103 yielded possible Tudor Green, Cistercian ware, Midlands yellow ware (all possibly 1600- 1700). 2 Two or three postholes approximately in the centre of the field, with broken pieces of wood, apparently quite modern - ?, postholes for tennis nets of courts running N/S across the slope. These had disappeared under caterpillar tracks by Saturday 21 st when we next came on site (the machine had been transferring spoil to the boundaries). 3 Six or more field drains running parallel NE/SW diagonally across the field, quite recent in appearance (red cylindrical tile, trench filled with small pebbles). 4 Two ashpits, one in the SE corner (feature F1), one approximately in the middle of the N edge of site (feature F2). Later sectioning of these confirmed both are modern. Both contained bottle glass, white glazed earthenware, with the bulk of the fill consisting of large lumps of clinker. (House A) natural pebble/sand/clay at 50cm approximately below original turf surface (House B) natural solid clay below pebble/sand/clay layer at 70cm approximately (House C) natural clay/gravel at 50cm approximately, except at W end which was within the darker disturbed area near the slip road referred to earlier. A darker disturbed area at the west end of House C was hand-investigated by spade and trowel (Trench 3), showing some features including a black silty layer. 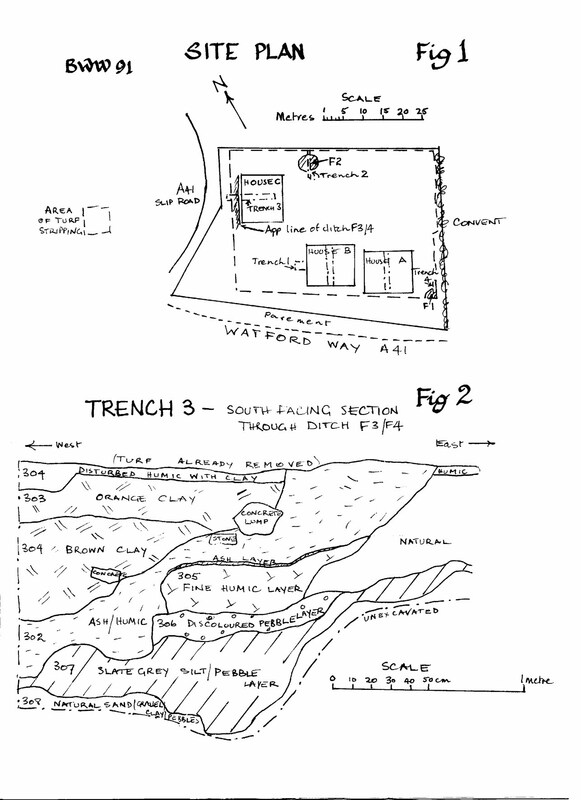 On 6 Jan 92 the Site Foreman kindly extended to the west by machine the 1m-wide trench, revealing the sections of what appear to be two ditches running N/S (features labelled F3 and F4). Section drawings appended (Fig 2). Clearly there are two ditches, the later, western, one cut through the W side of the first, the respective fills appearing to be different episodes, and silty layer 305 accumulating whilst the feature was open. In feature F4, layer 305 was overlaid by a clearly visible buried turf line. There was no dating evidence in the lowest part of the ditches; the only finds in silt 305 were 1 nail and some brick fragments. All three sections clearly showed that humic layer 305 was overlain by ashy layer 302, with a thin (c 1cm) ferrous layer at the interface of the two layers - its exact nature being unclear. Layer 302 contained a large quantity of stoneware, earthenware and bottle glass in addition to building rubble, suggesting a post-Victorian date for deposition. The stratigraphy of the ditches is quite complex; it appears that humic layer 305 may be the earliest definable deposit, overlain by relatively modern (ie Victorian or later) dump/fill ashy deposit 302, which itself was even more recently cut by the clay dump layers 303/304, the whole overlain by modern turf topsoil. It does not appear that the building work proposed will disturb any archaeological feature proposed will disturb any archaeological features of importance. The ditch F3 we can give no date to, but it may be of interest for the record. F4 was clearly later, cutting through the modern fill of F3. A further report will be prepared if needed. Two members observed a building trench machine-dug north-south along the apparent line of ditch F3. A black silty layer, obviously the silt of the ditch, was at the bottom (c 90cm deep) of the trench extending about 5 metres southwards from our excavation, where it appeared to curve westwards and disappear into the baulk. Trowelling the surface of the silt layer yielded no artefacts, so the ditch remains undated. DR HUGH CHAPMAN, President of LAMAS and General Secretary to the Society of Antiquaries, though not a member of HADAS, was known to many of us. In January 1973, when he was Assistant Curator at the City of London Guildhall Museum, he gave us a lecture on excavations at Aidgate. Then, in November 1980 when he was Keeper in the Department of Prehistoric and Roman Antiquities at the Museum of London, he gave us another lecture on "Roman London - an archaeological and antiquarian history". Sadly, we have to report that he died in June following a tragic fall in the street, from which he never regained consciousness. He was only 46. I am pleased to be able to announce that, following representations, English Heritage have added the listed buildings at Hendon to the Buildings at Risk List. Further, EH is writing to the Ministry of Defence, expressing their concern about the condition of the buildings. It is difficult to believe that the MoD will take much action - but at least the matter has been brought forward again. Perhaps only more frivolous members would care to mix their archaeology with thrillers. Tony Hillerman writes of crime in New Mexico and Arizona, pursued by the Navajo State Police. "A Thief of Time" (Sphere Books 1990, also in public libraries) tells of archaeological raids on ancient graves and ancient pottery sites in a mysterious background of canyons, pictographs, and the wide desert skies and distant mountains. One reader, unaccustomed to Navajo and Anasazi history and magic, said that the first third of the book required close concentration and the rest became 'unputdownable'. By any criteria, Hillerman can write! The Barnet Times reported on 11.6.92 that Barnet College Educational Trust, formed recently, intends to refurbish this building which began life as the Queen Elizabeth Boys' Grammar School. It is intended to provide a function, meeting and conference centre. They have the inevitable problem with cash to go ahead with the works this summer, but to help raise funds for this project a history of the hall by Dennis Marshall is being re-written by designer and lecturer John Marsh. The HADAS library copy of the Marshall book was lost in the fire, so we look forward to adding the new version to our shelves. Many thanks to the members who contributed articles to this edition. Please keep them rolling in as we are currently low on articles in hand. Ed.